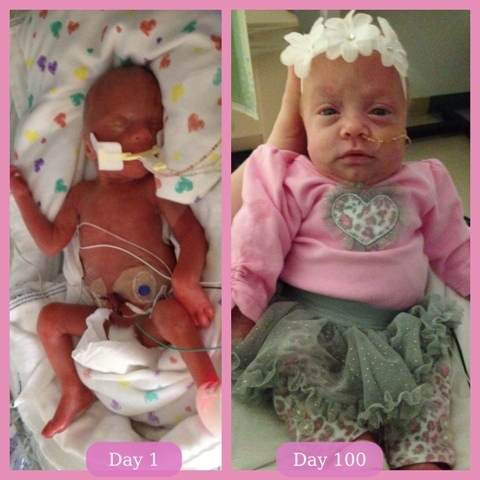 Briella's Journey: We Passed the 100 Day Mark! 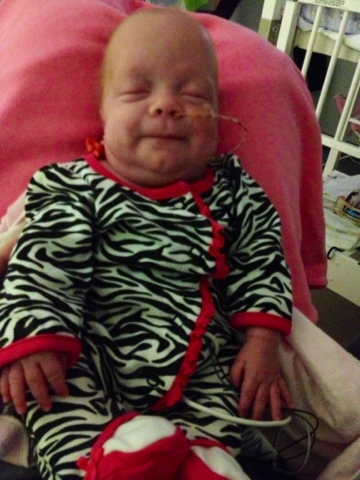 On our 100th day, I dressed Briella up in a cute outfit and we had a little 100 day celebration. I brought the nurses a cookie cake to thank them for everything they have done. I still cannot believe I get to hold my baby everyday. 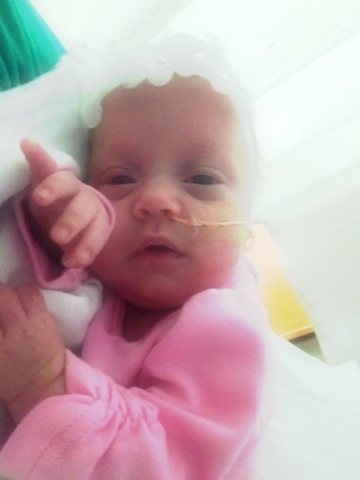 I am so thankful God chose me for this miracle. It is so great to hear from the doctors that the ONLY reason we are in the hospital is so that Briella can learn to take all of her bottles. Yesterday, she took 38mls/58mls for me, then her next bottle she drank the whole thing in 20 minutes! She usually does about half that in 30 minutes so I was very excited. Then she drank all of her midnight & 6am bottle also!!! I kept thinking, ok this is it. She is now going to take every bottle and we will be home for the weekend. I'm so proud and we are closer than we were last week. Briella's boyfriend Knox is going home this weekend!!! I am so happy for them! Briella has passed the 7 pound mark also! She is over 18 inches long. They have moved her down to 22 calorie Enfacare mixed with breastmilk. She will have 2 bottles a day of all enfacare to get extra protein. Also her iron & vitamin D have been stopped and replaced with a multi vitamin. The nurse says that means were close to going home!!!!! 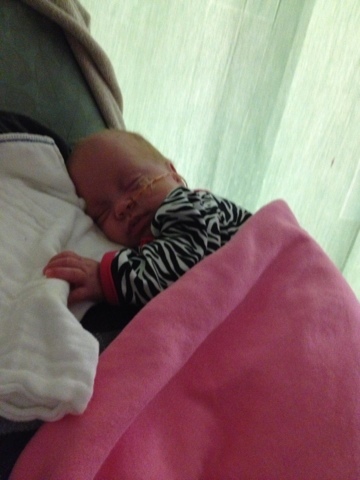 Please pray that Briella stays healthy & infection free. Pray that her ROP resolves itself. Pray that her MRI comes back normal. That is soooo awesome Stacy! Wow, look at how far she's come! I'm so happy to hear she's going to be home with you so soon! 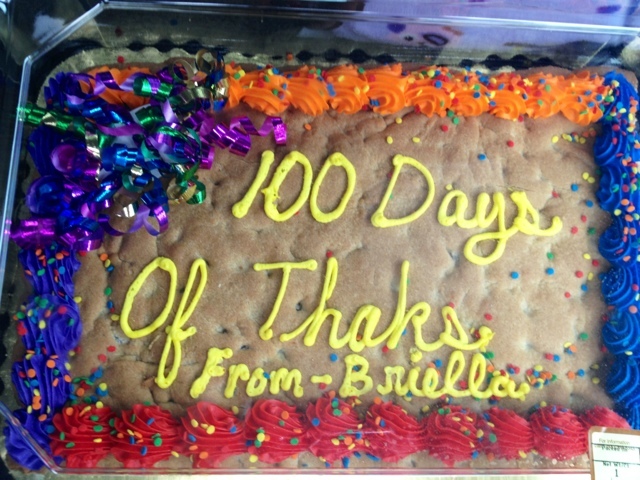 Happy 100th day Briella! That's amazing! Small note: you may want to go back to the bakery and talk to the person who decorated your cookie cake - they forgot the 'n' in 'thanks'!